If you want gorgeous nails and well-manicured hands, then consider using a cuticle remover. If you already use one but aren’t quite satisfied, it’s probably due to the fact that the majority of those on the market today just aren’t up to par with what you deserve. Poorly-executed products can lead to complications, from infections, to white spots, and ridges. We’ve created a list of the best cuticle removers so you don’t have to go through any of those beauty struggles! Before we get started with each product’s review, take a look at the table we’ve created below. It lists each best cuticle remover, along with their defining features so you can more quickly narrow down the possibilities! Now that you’ve seen what the top cuticle trimmers are, take a look below at each individual review to help select the best one for you. While it didn’t go under our “editor’s pick”, it was a close one. The BlueOrchids Professional Grade Cuticle Nipper with Cuticle Pusher is without a doubt, one of the best professional cuticle clippers on the market, today. The clipper itself has a stainless steel tip, and as it is surgical-quality, ensures that it’s excellent for home maintenance and professional use, alike. While most clippers out there are scary to use, and can even be somewhat dangerous, these make it easy to trim even the smallest of cuticles with precision. The half-jaw size allows you to even remove bits of dead skin around small areas that other products cannot reach. You’ll no longer have to worry about infections or cuts when your product should give you beautiful, well-manicured hands! These clips are created to give you a solid, sturdy grip so that you can maneuver them with precision. While they may look bulky, they’re actually quite smooth and comfortable when using them. The blades are aligned perfectly to further assist in a precise trim, and the handles are spring-loaded for not only a better grip but to make sure there are no accidents. Really, the only “con” we can think of, is that they’re probably not ideal for traveling. The clippers also come with a useful cuticle pusher and under-nail cleaner to further your perfectly-manicured look. 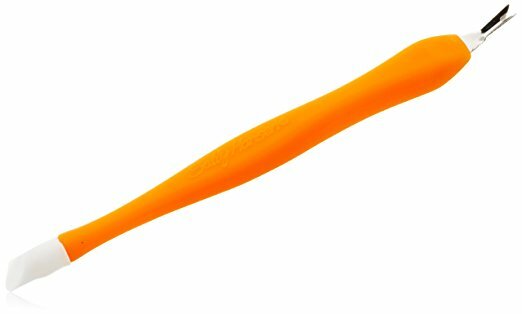 The cuticle pusher helps you achieve a deeper nail bed look, while the under-nail cleaner keeps your nails looking flawless. 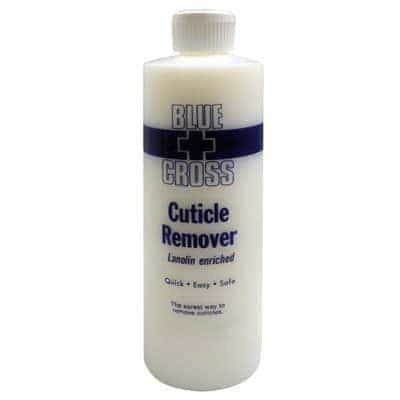 As you can probably see from the title, we pretty much loved the Blue Cross Cuticle Remover – for many reasons. When it comes to beauty and hygiene products like cuticle trimmers, we value quality and ease of use, which this best cuticle nipper of 2019 clearly demonstrated. This remover is not only quick and convenient, but also safe to use. You don’t have to worry about any chemicals having a bad reaction with your skin, or being in danger if you don’t wash your hands afterward. All you have to do is simply apply it, and simply push back your cuticles! In fact, if you watch any YouTube beauty experts in regards to nail care, you’ll find that they typically recommend the Blue Cross. Another asset, is the fact that the liquid doesn’t have an actual scent, which is great for those who have adverse reactions to certain smells. Overall, we loved this product, but have only one recommendation, which is to make the liquid a bit more thick in consistency. While it’s definitely quick and effective, the thinness can make it a bit more difficult to apply precisely where you’d like it. 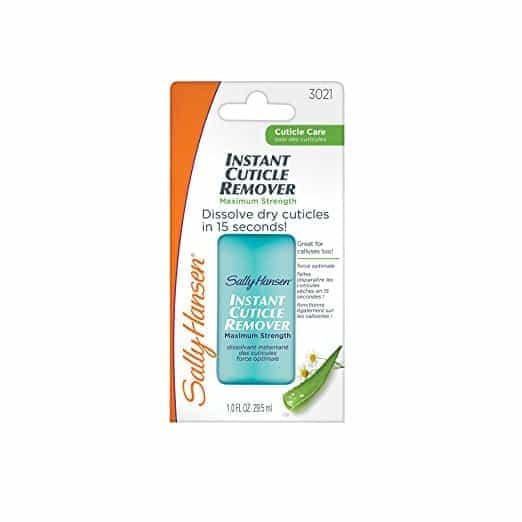 The Sally Hansen Instant Cuticle Remover is probably the easiest, quickest product to use on the market. If you check any cuticle remover reviews, they’ll tell you the same thing. The liquid remover features very minimal harsh chemicals, in an effort to make the best possible formula, gentle enough for the delicate skin around your nails, and your fingernails, themselves. In fact, the formula features ingredients such as aloe and chamomile to not only help moisturize, but to soothe the skin and nails, keeping them in pristine condition. If you have calluses on your hands, you can also apply the Sally Hansen gel cuticle remover, and it will help break them down, resulting in soft, smooth hands. As far as the application process goes, all you have to do is apply the gel/liquid to your cuticles (and under the tips of your nails if you’d like) and wait for about 15-20 seconds. After this time has passed, simply push back the cuticle and remove any remaining dead skin. We do recommend using a pusher to scrape away some excess, as it does not dissolve 100% on its own, most times. The Sally Hansen Push-N-Trim Cuticle Trimmer is a very lightweight pusher/cuticle trimmer that does the job right at a ridiculously low price. If you’re shopping on a budget, then just go ahead and click the “purchase” button now. This cuticle remover Sally Hansen has come out with functions to keep your nails looking bright and clean. It gently pushes back cuticles, and features a v-shaped blade that evenly and accurately trims hangnails, extra skin, and overgrown cuticles. If you’d like the ultimate it cuticle-removing, then we recommend you combine this one with one of the removing liquids or gels on the list, as it works to soften the cuticles, while this one just trims. The ProLinc Cuticle Eliminator not only works to effectively soften and help eliminate excess cuticles, but also clean underneath and around your nails for a well-groomed feel and look. It can even remove “build-up” under the edges of fingernails and toenails, making it a great tool for pedicures, too. The remover takes a bit longer than some others: on average, it works in around 45-60 seconds. It’s overall a pretty gentle product to use on delicate skin and nails, however, it should be noted that it does not include added ingredients such as aloe vera, like others do. For this reason, we recommend adding on some kind of nourishing lotion or liquid onto your nails and the surrounding skin afterward. We know how difficult it can be to purchase beauty products. You want to make sure you’re getting the best “bang for your buck” while also receiving a high-quality product that actually works! We’ve gone ahead and made a simple, straightforward guide to help lead you to purchase one of the best cuticle remover creams, gels, liquids, or clippers. 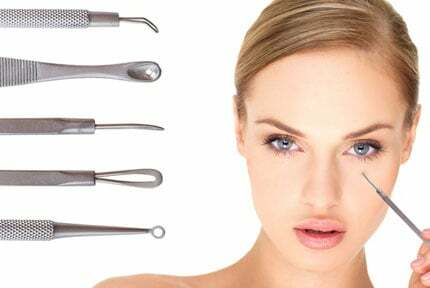 There are 3 different types of cuticle removers to consider. They all have their own individual benefits, as well as detriments. It all comes down to your personal preference, and what you’ll need them for, specifically. Cuticle trimmers are quite popular for home use, but you will likely see them used in salons more than anywhere else. They are similarly designed as scissors, but are much more precise. As previously mentioned, the majority of these trimmers shouldn’t be used, unless by a professional. The one we have at the top of our list is user-friendly and can be used by those who aren’t professionals. Liquid removers offer a great alternative to cutters. They have the benefit of being very easy to use, as all you have to do is apply the liquid or gel to the skin or cuticle, and it starts to break down. Another benefit, is the fact that they are so safe to use. You won’t have to worry about accidentally cutting or snipping yourself, which can result in infections. They’re also much more inexpensive than the previously-mentioned snippers. A downside, however, is that depending on the formula, they can potentially dry out your nails and skin, making the nails brittle. However, this isn’t the case with all of them. 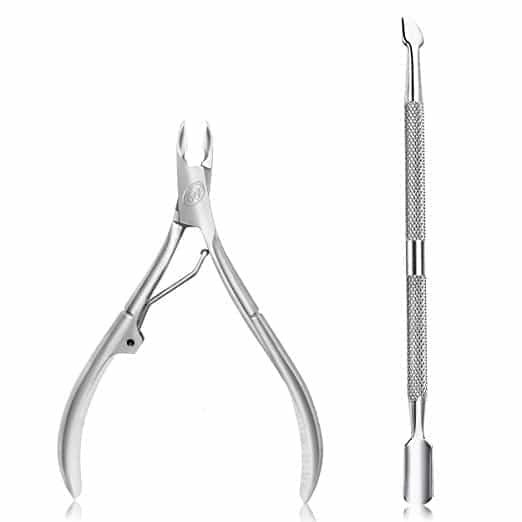 Cuticle pushers simply push the cuticles back and away from your nails. 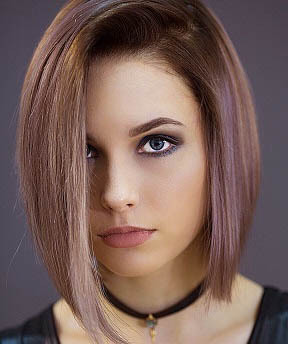 Many people don’t stop there, however, they also use them in combination with liquid removers for better results, and with cutters for more precise trimming. While price is a large consideration for many beauty products, such as tanning oil, it isn’t as big of a factor in this market. However, generally speaking, the liquid removers are going to be much less expensive than the full-blown clippers. If you’re thinking about purchasing a liquid remover, it’s a good idea to check the list of ingredients. To be on the safe side and ensure that your skin won’t become damaged, it’s wise to stick to liquid removers that contain as few chemicals as possible. Some also contain soothing ingredients like aloe vera or chamomile, to counteract potential drying effects that some may have. As just mentioned, if you have sensitive skin it’s always a good idea to go with a remover with primarily natural ingredients. However, sometimes you need something a little more powerful to remove your cuticles or any build-up you may have underneath your nails. If this is the case, then formulations with chemicals added may work better. User reviews generally paint a pretty good picture with how these react with their skin, but the ones on our list all were pretty calm and soothing. Another consideration if you’re thinking about purchasing a liquid remover is the size of the bottle. Purchasing a larger bottle usually saves you a bit of money and they are ideal if removing your cuticles is something you’re planning on doing often. Some of the best cuticle removers allow you to remove your cuticles right away, whereas others require additional steps for best results. With that being said, it’s always a good idea to kind of get an idea of just how much time you’re going to want to spend on this aspect of your beauty regime every time it’s necessary. There were a couple products on our list that really stuck out to us. The first one is the BlueOrchids Trimmer, which is a surgical-grade, stainless steel clipper that cleanly and precisely trims your cuticles, hangnails, and dead skin, to leave you with a beautiful, flawless manicured look. These trimmers are so durable, it will more than make up for the more expensive price it comes with. Another bonus is the fact that these don’t just soften the cuticles like so many others do; they actually remove them (although, pairing them with a cuticle softener is a great idea). The second was our “editor’s pick”, the Blue Cross Cuticle Remover. We chose this one, simply because it’s super simple and straightforward to use, is cheap, and takes a very short amount of time to work. It’s also great for traveling with, unlike the BlueOrchids trimmer, which you would probably not be able to get on a plane with. Regardless of which product you go with, we can assure you that you’re going to love your new best cuticle remover!